It's time to stop thinking about the markets and the economy. In fact -- do anything except thing about those two things right now. The wealth of American families plunged nearly 18% in 2008, erasing years of sharp gains on housing and stocks and marking the biggest loss since the Federal Reserve began keeping track after World War II. The Fed said Thursday that U.S. households' net worth tumbled by $11 trillion -- a decline in a single year that equals the combined annual output of Germany, Japan and the U.K. The data signal the end of an epoch defined by first and second homes, rising retirement funds and ever-fatter portfolios. Past downturns have been mere blips compared with the losses Americans faced last year, which set them back to below 2004 levels. 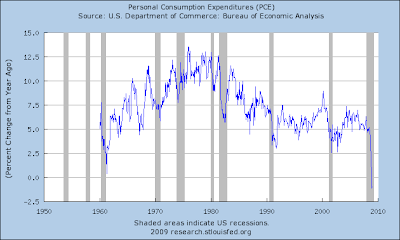 "In the postwar period, we've never had anything other than very modest declines. That life experience led many people to think that houses were a one-way bet," says Douglas Cliggott, the chief investment officer of Dover Management LLC. 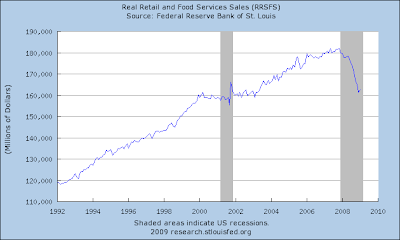 This is a primary reason why I am not optimistic about the bump in retail spending. Simply put, people are poorer and when they are poorer they spend less. The plan has a very interesting table regarding multipliers. A multiplier is an estimate of the "cumulative impact of various policy options on GDP over several quarters"
Notice that spending can have a minimum multiplier of 1 -- meaning each dollar spent adds that dollar to the national GDP total -- and a maximum multiplier of 2.5 -- meaning each dollar spent adds 2.5 dollars to total GDP. The truth is most likely in the middle somewhere. The reason for this multiplier effect is simple. Government body buys $1 of goods. Someone has to sell those goods to the government. In addition, someone has to make those goods which are then sold to the government. And someone has to extract the raw materials to put into those goods. In short, a purchase stimulates the entire chain of production from extraction to sale. Hence the possibility of a higher multiplier. First, these estimates are from the Joint Committee on Taxation, whose website is here. Notice that with tax cuts the multiplier is higher for lower and middle income tax cuts than upper income tax cuts. Why? A tax cut for lower and middle income people effects a larger amount of people -- that is, there are more taxpayers in the middle income brackets than higher tax brackets. According to this table from the Tax Policy Center there were 1448 tax units in the 28% tax bracket in in 2007 compared with 73 in the 33% bracket. Basically, this is simple math. 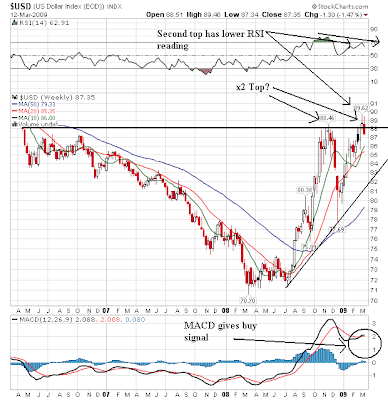 The weekly chart shows the dollar is deciding whether it wants to form a double top or continue rallying. 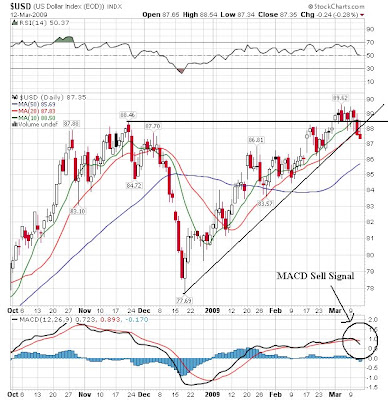 In the "continuing to rally" camp there is a bullish indication from the MACD, the fact that prices have moved through previous highs the fact that prices are still in a confirmed uptrend. In the "we're forming a double top" camp is the lower RSI for the second peak than the first peak along with the weak candles at the very top (a spinning top followed by a strong move down). OK -- it's yesterday's markets. But you get the idea. The 10 day chart shows an impressive rally that has returned prices to their level 10 days ago. Note there are several possible trend lines for this mini-rally. Ignore the last bar on the chart. Prices have moved through the 10 and 20 day SMA in three days and the 10 day SMA is starting to move into positive territory, but we're a long way off from a big turnaround. Prices have increased about 11% in the last three days. that's an impressive rally. My guess is there are several reasons. 1.) A standard short-covering rally. 2.) The market has been technically oversold for weeks, yet has continued to move lowed. Oversold readings usually lead to strong counter-rallies. Actually -- I'm in a meeting for the rest of the day. I'll post this first thing in the morning. The U.S. Census Bureau announced today that advance estimates of U.S. retail and food services sales for February, adjusted for seasonal variation and holiday and trading-day differences, but not for price changes, were $346.8 billion, a decrease of 0.1 percent (±0.5%)* from the previous month and 8.6 percent (±0.7%) below February 2008. Total sales for the December 2008 through February 2009 period were down 9.4 percent (±0.5%) from the same period a year ago. The December 2008 to January 2009 percent change was revised from +1.0 percent (±0.5%) to +1.8 percent (±0.2%). 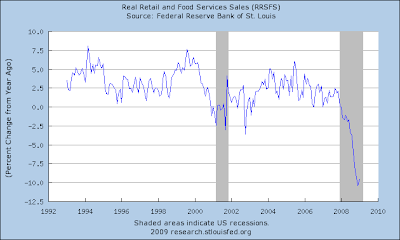 Retail trade sales were down 0.1 percent (±0.7%)* from January 2009 and 9.8 percent (±0.7%) below last year. Gasoline stations sales were down 32.3 percent (±1.7%) from February 2008 and motor vehicle and parts dealers sales were down 23.5 percent (±2.1%) from last year. First -- could the people at the Census start adjusting these numbers for inflation? Nominal numbers are just worthless. 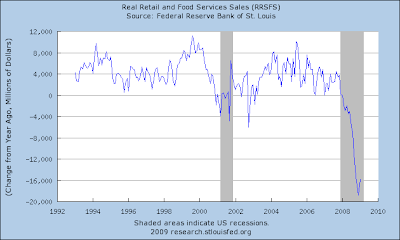 Retail sales have dropped hard and fast for over a year. To say this is a reprieve from the drop is very premature. And the YOY chart shows we've got serious problems as well. And as the advance chart shows the auto industry is still in serious trouble. When I see people start to move back into the auto and housing market -- which would indicate more confidence in the future -- then I'll be relieved. I'm going to spend a bit of time over the next few days on the stimulus plan. It is the most important bill to come down the Congressional pike in some time. I'll be using the CBOs analysis which is available here (click on PDF). Without the plan we're looking at a drop in GDP in the 4th quarter of this year of roughly 7% below out output potential. More importantly, look closely at the GDP baseline estimate for national GDP going forward (the solid line at the bottom). According to the CBO we would be experiencing a "net output gap" (producing at a level below out maximum potential) for 5 years. That's one heck of a big problem staring us in the face. While these are estimates and therefore subject to debate regarding their veracity, it highlights the central problem. The US has been in a recession since December 2007. Over the last 12 months the economy has lost 5 million jobs. In January, industrial production was 10% below year ago levels. GDP contracted at a 6.2% rate in the fourth quarter. In short, the US is limping right now and is clearly in need of some help. In short, the CBO feels confident in their analysis of crowding out relative to private investment but not so confident regarding the long-term effects of infrastructure and education spending. The point here is a lot was made of the CBO saying this plan would hurt the economy. But -- the CBO is issuing a pretty big caveat. Despite halts on new foreclosures by several major lenders, the number of households threatened with losing their homes rose 30 percent in February from last year's levels, RealtyTrac reported Thursday. Still, the faltering economy, driven down by the collapse of the housing bubble, is causing the housing crisis to spread. Nearly 12 percent of all Americans with a mortgage -- a record 5.4 million homeowners -- were at least one month late or in foreclosure at the end of last year, according to the Mortgage Bankers Association. That's up from 10 percent at the end of the third quarter, and up from 8 percent at the end of 2007. 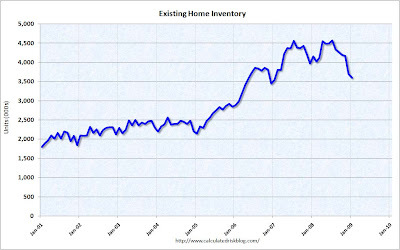 If we add the 700,000 "shadow inventory" to the current existing inventory we're back over 4 million total houses for sale (click for larger image. Thanks to Calculated Risk). 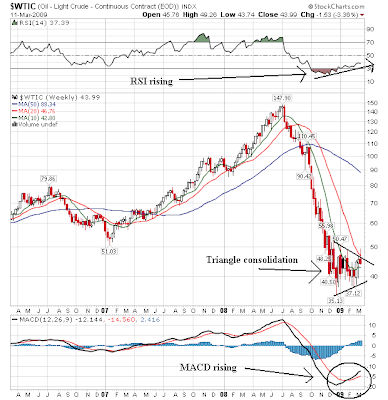 The weekly chart shows the market is still in a triangle consolidation pattern. However, notice the RSI is rising and the MACD has given us a bullish crossover signal. The MACD has been rising since November and the RSI has been increasing for the last month. In addition, this chart clearly shows the triangle consolidation that started at the end of last year. The SMA picture is still muddled with the 10, 20 and 50 bunched together within a few points of each other. However, the summer is typically a time when oil rallies as the "summer driving season" kicks into high gear. While the SPYs were up today, the chart tells us that prices made most of their up on the open. Prices trended down until a little after 1 then rallied with a sell-off into the end. On the 10 day chart, notice the market was moving lower through last Friday. But since Monday the market has been moving higher. In other words, it's looking more like we're in a reversal of the downtrend. On the daily chart, notice that prices have bounced through the 10 day SMA. However, also notice that volume for the last two days is low compared to the sell-off the preceding few days. One analyst has downgraded Bank of America to a sell. The median recommendation is a 2.5 on a scale of 5 with 5 being sell. The median recommendation for Citigroup is 3.1 on a scale of 5 with 5 being sell. And to think these people still go on TV and make recommendations. But Citi has an operating profit so far in 2009 — excluding likely write-downs and loan loss provisions — CEO Vikram Pandit said in an internal memo to staff Monday. "I am most encouraged with the strength of our business so far in 2009," he wrote. "We are profitable through the first two months of 2009 and are having our best quarter-to-date performance since the third quarter of 2007." They forgot to add the phrase "sucker" to the internal memo. For the last few weeks markets have been dying to hear good news -- any good news. However, trusting anyone involved with a financial firm is stupid beyond belief. 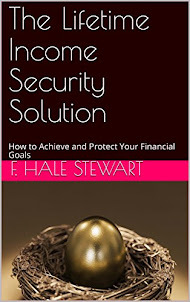 But Wall Street has learned to distrust claims of financial health. The CEOs of mortgage finance giants Freddie Mac (FRE) and Fannie Mae (FNM) expressed confidence in their firms' viability before they were taken into receivership. Lehman Bros.' CEO gave similar assurances before the investment bank went bankrupt last year. "One of the questions investors have is transparency. How much information are they telling me and what's the validity of the information," said Kris Niswander, associate director at SNL Financial. Let's just say I'll believe it when I see it. The Gold chart is right at an important trend line -- one that started in the 4Q of last year. Part of the reason for the rally is a safe haven play; whenever investors get scared about the future gold becomes an attractive investment. 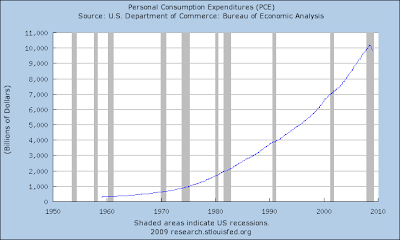 In addition, inflationary concerns were rising due to the massive amount of government spending hitting the system. The three month chart shows the correction in more detail. Prices are right at the trend line. In addition, prices are at the 50 day SMA which is another important technical marker. The short term SMAs -- the 10 day SMA -- has turned lower and the 20 day SMA is turning horizontal. In other words, the upward momentum is cooling. From a fundamental perspective it appears that traders/investors have cooled on gold. However, we are in very uncertain times right now which could help gold catch a bid. Wow - I'd almost forgotten what a market rally looked like! Seriously, the market popped higher on the open, consolidated gains and then moved higher at 11. Prices drifted lower until 1:30 and then moved higher into the close. All in all a nice day. Simply notice that the 10 day long downward move may have been broken. What we need tomorrow is a follow-through day. Federal Reserve Chairman Ben S. Bernanke urged a sweeping overhaul of U.S. financial regulations in an effort to smooth out the boom-and-bust cycles in financial markets. “We should review regulatory policies and accounting rules to ensure that they do not induce excessive” swings in the financial system and economy, the central bank chief said today in remarks prepared for an address to the Council on Foreign Relations in Washington. Bernanke recommended that lawmakers and supervisors rethink everything from the amounts firms set aside against potential trading losses and deposit-insurance fees to protections for money-market funds. His remarks reflect a judgment that the U.S., just like emerging-market nations in the past, failed to properly manage a flood of capital over the past decade and a half. Bernanke also reiterated his call for an agency to take on overarching responsibility for financial stability. While he didn’t specify which regulator should take that job, he noted that the Fed was first formed to address banking panics and said the initiative would “require” some role for the central bank. Congress and the Obama administration are embarking on the broadest revamp of the oversight of U.S. finance since the Great Depression. Bernanke’s speech marks the Fed’s contribution to the policy debate. The job market may get worse before it gets better, according to the latest Manpower survey of U.S. employers' hiring plans. For the first time since the survey started in 1962, the seasonally adjusted net employment outlook -- the number of firms hiring minus those firing workers -- turned negative. A net -1% of firms expect to hire in the April through June period, down from 10% in the first quarter and 15% for the second quarter a year ago, on a seasonally adjusted basis, according to Manpower's quarterly survey. 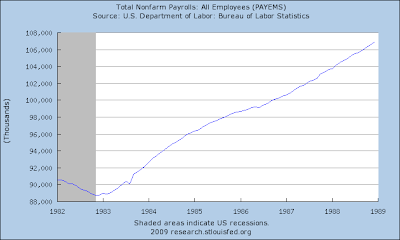 The previous low point was in 1982, when a net 1% of firms planned to hire in the third quarter. See related story on the jobless rate hitting 8.1% in February. Manpower's survey of 31,800 U.S. companies measures the percentage of firms planning to hire minus those intending layoffs. Manpower doesn't measure the number of jobs. The survey's margin of error is +/- 0.55%. The previous low point for the non-seasonally-adjusted employment outlook was -1% in 1983's first quarter. This shouldn't really be surprising considering the overall macro economic environment. GDP dropped 6.2% in the fourth quarter. In that report we learned that PCEs, gross private domestic investment and exports were down. Industrial production is down 10% from year ago levels. Unemployment is already at 8.1%. In short, this is a time when businesses will be cautious. The article gives two possible dates for the previous record low. I'm going to assume the 1982 date is for seasonally adjusted data. Using 1982 and assuming the worst reading of the data -- and assuming that 1982 and the current situation are sufficiently similar to warrant comparison -- we still have a ways to go on the employment front. However -- employment is a lagging indicator, meaning it starts to increase after there is a bit of a rebound. So assuming the worse case -- that we have a year to go before we see a bottom in employment -- we have at least one more quarter of seriously negative GDP news followed (hopefully) by a slowdown in the rate of GDP decline. In other words, we have a terrible first half and a not-so-bad second half. At least -- that's what we hope. Notice on this 1 year chart that while bond prices were at incredibly high levels at the beginning of the year they have since come down. Prices are still over the 200 day SMA indicating a bull market, however. 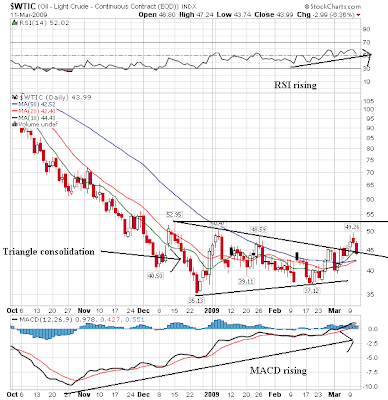 Prices have been consolidating in a triangle consolidation pattern since the beginning of February. However, the SMAs are now giving a different picture. The 50 and 10 day SMA are moving lower while the 20 day is moving higher. Prices are tied together with the 10 and 20 day SMA indicating a lack of direction. From a fundamental perspective there are two macro-situations competing right now. Pulling prices lower is the massive supply of treasury bonds coming to market over the next 9-12 months. However, keeping prices higher is the safety play which will continue to long as the stock market continues to move lower. Today I was on the BBC Program World Have Your Say. Here is a link to the show. I was on in the last 7-10 minutes. On the daily chart notice we're in a very bearish position. Prices are moving lower, prices are below all the SMAs, the shorter SMAs are below the longer SMAs and all the SMAs are moving lower. While the chart today printed a hammer, we printed a similar bar a littel over a week ago and it didn't do much. However, today we saw lower volume which could be encouraging. For the second day in a row prices opened higher but were unable to maintain their upward momentum. However, prices today closed above the lows of Friday. In addition there were two bars moving higher at the end of trading with strong volume surges. However, I wouldn't get too excited about that just yet. Yeah. The economy, ever since we talked in September, we talked about it being an economic Pearl Harbor and how--what was happening in the financial world would move over to the real world very quickly. It's fallen off a cliff, and not only has the economy slowed down a lot, people have really changed their behavior like nothing I've ever seen. Luxury goods and that sort of thing have just sort of stopped, and that's why Walmart is doing well and you know, and I won't name the ones that are doing poorly. But there's been a reset in people's minds, and we see that in something like Geico where year after year after year we say you can save some money insuring with Geico, and year after year there's been a certain number of people who have said, `You know, I've got this pal, Rotary Joe, and I've been insuring with him and for 100 bucks, why should I shift?' Every week we're just seeing it build and build. More and more people are calling. Our price differentials haven't widened, our advertising isn't that much different, but the American public really has changed their buying habits. On the reverse side, our jewelry stores just get killed in a period like this. And high end gets hurt the most, next down gets hurt the second most, and the lowest people get hurt the least. Take a look at this chart from the WSJ. 7 stores posted gains in February. 4 (BJs, Sam's Wal-Mart and Costco) were discounters. U.S. companies have already slashed $40.7 billion in dividends in 2009, topping last year's $40.6 billion in just over two months. No bank now ranks among the top 30 dividend-paying companies in terms of total dollars. Financial companies pay out only 11% of dividend income vs. more than 30% before the credit crisis hit, says S&P analyst Howard Silverblatt. Dividends among S&P 500 companies are on track to fall 22.6% in 2009, the most since 1938, with many more cuts likely. The pain has spread from shareholders in banks to investors in auto, consumer discretionary and other stocks. This shouldn't be a surprise. But it is another reason for more investors getting out of the market. While I usually don't line line charts, this one helps to show the major trend of the last year. Prices are in a clear downtrend. Rallies have been bear market flags or pennant patterns that have offered an opportunity to short the market. Above is the same chart of the SPYs but with candles. The following charts show the market is oversold. However, the MACD tells us we have a ways to go.